The main railway station of Budapest has finally opened its doors to hundreds of people after their two-day stand-off nearby. 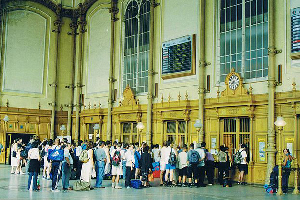 Since the end of August 2015, considerable disruption to road and rail transport has been witnessed from the Hungarian capital to the Austrian border. Vast numbers of migrants transit to Europe through Hungary despite the police and border enforcement actions. Earlier this week images of Czech police officers writing numbers on the migrants’ hands were strongly criticised as an unfortunate reminders of a different event in last century. The number of migrants arriving to Europe has reached its record with more than 100,000 people entering in July this year. Germany expects up to 800,000 migrants to come this year which exceeds the last year’s number four times. Disagreement over the European Union migration policy has led to many countries complaining for being overwhelmed by the numbers of people arriving on their shores. Germany is said to be prepared to accept such numbers of migrants while other countries are not. Annually, approximately 400,000 British residents visit Hungary and though most trips are generally safe, the FCO strongly recommend obtaining comprehensive travel insurance before each trip to Hungary, especially given the current situation. UK EU Referendum Results - Delighted or Defiant?